Carbon dividends are the hottest idea in climate policy. A diverse mix of progressive and conservative voices are backing the idea of returning carbon tax revenues to households in the form of regular “dividend” payments. So are a range of businesses and environmental groups. Two weeks ago, six House members—three Democrats and three Republicans—introduced carbon dividend legislation. While the premise is simple, the details of implementing carbon dividends are complex. Policymakers face a range of philosophical, political, and practical issues. In a new report, How to Design Carbon Dividends, my Tax Policy Center colleague Elaine Maag and I explore those issues. Our work was funded by the Climate Leadership Council, an advocate for carbon dividends (full disclosure: I am a senior research fellow with the organization). Two distinct philosophic views animate carbon dividend proposals. One sees dividends as shared income from a communal property right. Just as Alaskans share in income from the state’s oil resources, so could Americans share in income from use of atmospheric resources. The second sees dividends as a way to rebate carbon tax revenues back to the consumers who ultimately pay them. Though these ideas can be complementary, they have different implications for designing carbon dividends. The communal property view, for example, implies people should receive identical dividends that would be taxed as a new source of income. But those who see dividends as a tax rebate would link the payment to a person’s carbon tax burden and make the payment tax-free. Similar differences arise for dividend eligibility, the treatment of children, and other issues. Elaine and I show how dividends should be designed under each of these views. But we do not recommend either pure approach. Political and practical concerns also matter. Instead, we suggest a hybrid model that combines the best of both ideas. As a starting point, we suggest US residents with Social Security numbers (a group that could be expanded) would be eligible for dividends that would be paid out quarterly. Adults would receive equal dividends. Children would receive half as much as adults. Dividends would not be taxed as income, nor would they be treated as income in means-tested benefit programs such as SNAP (food stamps). Our proposal strikes a balance among the philosophical, political, and practical issues. Paying identical dividends to adults, for example, reflects the communal property view – but halving the benefit for children nods in the direction of a rebate. Paying dividends quarterly reflects both practical and political concerns. They’d be less complicated, less costly to administer, and more visible than smaller, monthly payments. Unfortunately, the dividend would be somewhat less than the amount of revenue collected by the tax. If life were simple, outgoing dividends would equal incoming carbon tax receipts. But rebating all the revenue would significantly increase budget deficits. Why? Because it would cost the government money to manage the tax and dividend program. And the government itself would bear some of the cost of the carbon tax. To keep from adding to the deficit, the government must keep enough revenue to cover those costs. To illustrate, suppose a carbon tax of $43 per metric ton goes into effect in 2021, as the Climate Leadership Council has proposed. Gross revenues would be about $200 billion. It would cost the government about $6 billion to operate the dividend program and cuts in other revenues and higher spending would total more than $40 billion. Thus, to avoid deficit increases, the dividend pool would be about $150 billion. Even with these offsets, we estimate that eligible adults would receive an annual dividend of $570 in 2021 while a family of two adults and two children would get $1,710. Different design choices could raise or lower these amounts. Collecting income tax on dividends, for example, would allow larger dividends. But the after-tax dividend would be the same, on average, with more going to people in lower income tax brackets and less to those in higher ones. Different treatment of children also would change dividends. Giving children full dividends, for example, would reduce dividends for adults, but increase them for families with children. Dividend amounts could also vary depending on eligibility, participation rates, the size of the carbon tax, and other factors. In short, details matter in designing carbon dividends. We hope our paper provides a useful guide to those details and the choices and tradeoffs that carbon dividends pose. Adele Morris co-authored this post. A US carbon tax could raise $1 trillion or more in new revenue over the next decade. There is no shortage of ways to use it. Tax reformers want to cut business and personal taxes. Budget hawks want to reduce future deficits. Environmental advocates want to invest in clean energy. Progressives want to expand the social safety net. And so on. Fund public priorities unrelated to climate. Each has merit, especially as part of an effort to build a political coalition to enact and maintain a carbon tax. But some ideas have more merit than others. On both policy and political grounds, it makes sense to use carbon tax revenue to soften the blow on lower-income households and coal workers and their communities. Doing so will require only a small fraction (15 percent or so) of carbon tax revenue, leaving substantial resources for other purposes. Recycling revenue into broader cuts in personal and business taxes also has particular merit. It can help offset the economic burden of the carbon tax and facilitate pro-growth tax reforms. By assuaging concerns that a carbon tax is just another way to expand government, moreover, revenue recycling may be essential to enacting a tax. However, requiring strict revenue neutrality also has downsides. Some policy goals, such as assistance to displaced coal workers, could be better pursued by spending the money directly, rather than indirectly through the tax system. Policymakers should approach other uses of carbon tax revenue with more caution. For instance, they should be careful in using revenues to try to cut emissions further. A well-designed carbon tax would do a good job reducing greenhouse gas emissions, so additional policy initiatives should focus on filling in gaps—reducing emissions the tax may miss. Merely duplicating efforts—e.g., supporting clean electricity facilities—would not be cost effective. Indeed, policymakers could roll back tax credits for solar and wind power and other subsidies and mandates that a sizable carbon tax would make redundant. That would free up resources to pursue other, more beneficial goals. Policymakers should be similarly cautious about tightly linking revenue to specific new spending, whether climate-related (e.g., coastal protection) or not (e.g., new highways). Earmarking risks overspending on any one line item, deploying resources inefficiently, and fueling concerns that the tax would become a slush fund for politicians’ pet projects. Decarbonizing the economy requires long-term solutions. Many emissions-reducing investments involve large expenditures on long-lived capital, such as power plants and industrial facilities. A carbon tax package that businesses and people believe will endure will be more environmentally successful than one that people think may not survive the next election. In Australia, for instance, a carbon tax that took effect in 2012 was repealed just two years later, an object lesson in how highly partisan climate policies can be rescinded by future governments. Policymakers should thus give special attention to identifying revenue uses that build ongoing support for a carbon tax. What do indoor tanning, shopping bags, junk food, alcoholic beverages, tobacco, “gas guzzling” cars, ozone-depleting chemicals, sugary drinks, marijuana, gasoline, coal, carbon-containing fuels, and financial transactions have in common? Taxes that discourage them. The United States taxes indoor tanning to reduce skin cancer, for example, while Washington DC taxes shopping bags to cut litter, and Mexico taxes junk food to fight obesity. Governments hope these “corrective taxes” will reduce harms from pollution, unhealthy consumption, and other risky behaviors. But taxing “bads” can also bring in big money. A US carbon tax could easily raise more than $100 billion annually, for example, and a tax on sugary drinks could raise $10 billion. Advocates often suggest that revenue be put toward the same goal as the tax. Carbon tax revenues might subsidize energy efficiency or clean energy, for example, and sugary drink revenues might subsidize healthier food or nutrition information programs. Using revenue that way may make sense if you believe the tax won’t sufficiently change business and consumer choices. But there are downsides. A successful tax will typically reduce the potential benefits from other policies aimed at the same goal. As a result, it may make sense to roll back other policies, rather than expand them, when a substantial corrective tax is implemented. Directing revenues to the same goal may also limit lawmakers’ ability to build a coalition for a corrective tax, while other uses may attract supporters with other priorities. Another approach is to use the revenue to offset the burdens that a corrective tax creates. New taxes on food, energy, and other products can squeeze household budgets, particularly for families with lower incomes. Shrinking the market for targeted products may disproportionately burden specific workers, industries, and communities. If a tax is large enough, moreover, it may slow overall economic activity. Tax cuts, expansions in transfer programs, or other spending increases may offset some of these harms while leaving the incentives intact. This is particularly important when taxes are intended to help people who suffer from internalities—health risks and other costs they unintentionally impose on themselves. In those cases, rebating revenue to affected consumers can help ensure that a tax actually helps the people who pay it. A third approach is to use revenues to offset costs of the taxed activity. If an activity imposes costs on an identifiable group of people, it may make sense to compensate them for the harm. A US tax on coal does this, for example, by funding assistance to workers who develop black lung disease. Revenues can also cover some costs of providing public services that support the taxed activity. Fuel taxes paid by drivers, airplane passengers, and maritime shippers , for example, help fund the creation and maintenance of the associated infrastructure. Finally, governments could treat corrective taxes like any revenue source, with receipts used to reduce borrowing, boost spending, or cut taxes in ways unrelated to the goal of the tax. Governments could allocate the money using ordinary budget processes, as Berkeley, California does with its soda tax revenue, or could earmark revenues to specific efforts, as France does by directing some financial transactions tax revenue to international aid. Policymakers must consider a host of factors when deciding what mix of these options to pursue. Complete flexibility may allow them to put revenue to its best use over time. But surveys suggest that the public is often skeptical of corrective taxes if they don’t know how the revenue will be used. Many worry, for example, that the corrective intent of a tax may just be a cover story for policymakers’ real goal of expanding government. Recycling corrective tax revenue into offsetting tax cuts can assuage that concern. But revenue neutrality has downsides as well. Matching incoming revenues and offsetting tax cuts may be difficult, given uncertainties in future revenues from a corrective tax and any offsetting tax cuts. In addition, it may be easier to achieve some distributional goals through spending than tax reductions. For example, a new spending program may be a more straightforward way to help coal miners hurt by a carbon tax than some kludgy tax credit. People who generally oppose wholesale revenue increases from corrective taxes should thus be open to modest deviations from revenue neutrality that provide a more effective way to accomplish policy goals. Climate change is hot. From the pope’s encyclical to the upcoming United Nations conference in Paris, leaders are debating how to slow and eventually stop the warming of our planet. We economists think we have an answer: put a price on carbon dioxide and the other gases driving climate change. When emissions are free, businesses, consumers, and governments pollute without thinking. But put a price on that pollution and watch how clean they become. That’s the theory. And it’s a good one. But translating it from the economist’s whiteboard to reality is challenging. A carbon price that works well in principle may stumble in practice. A real carbon price will inevitably fall short of the theoretical ideal. Practical design challenges thus deserve close attention. To help policymakers, analysts, and the public address those challenges, Eric Toder, Lydia Austin, and I have published a new report, “Taxing Carbon: What, Why, and How,” on putting a price on carbon. Lawmakers could put a price on carbon either by levying a tax or by setting a limit on emissions and allowing trading of emission rights. These approaches have much in common. Politically, however, a carbon tax is on the upswing. Cap and trade failed in 2010, while interest in taxing carbon is growing, including three bills in Congress and endorsements from analysts of diverse ideological stripes. Carbon prices already exist. At least 15 governments tax carbon outright, and more than 25 have emissions trading systems. Those efforts have demonstrated that the economists’ logic holds. If you put a price on carbon, people emit less. Figuring out the appropriate tax rate is hard. The Obama administration estimates that the “social cost of carbon” is currently about $42 per metric ton. But the right figure could easily be double that, or half. That uncertainty is not a reason to not tax carbon. But it does mean we should maintain flexibility to revisit the price as new evidence arrives. Taxing carbon could reduce the need for regulations, tax breaks, and other subsidies that currently encourage cleaner energy. Rolling back those policies, in particular EPA regulations for existing power plants, may make policy sense and will likely be essential to the politics of enacting a carbon tax. But the details matter. Rolling back existing policies makes more sense with a carbon tax that’s high and broad, than with one that’s low and narrow. By itself, a carbon tax would be regressive: low-income families would bear a greater burden, relative to their incomes, than would high-income families. We can reduce that burden, or even reverse it, by recycling some carbon revenue into refundable tax credits or other tax cuts focused on low-income families. By itself, a carbon tax would weaken the overall economy, at least for several decades. That too can be reduced, and perhaps even reversed, by recycling some carbon revenue into offsetting tax cuts, such as to corporate income taxes. Unfortunately, there’s a tradeoff. The most progressive recycling options do the least to help economic growth. And the recycling options that do the most for growth would leave the tax system less progressive. A global agreement on carbon reductions would be preferable to the United States acting alone. Given the nation’s size and contribution to global emissions, a unilateral tax would make a difference, but would damage the competitiveness of some US industries. Special relief for these sectors could reduce the benefits of the tax, but may be necessary both practically and politically. A carbon tax won’t be perfect. Done well, however, it could efficiently reduce the emissions that cause climate change and encourage innovation in cleaner technologies. The resulting revenue could finance tax reductions, spending priorities, or deficit reduction—policies that could offset the tax’s distributional and economic burdens, improve the environment, or otherwise lift Americans’ well-being. The challenge is designing a carbon tax that delivers on that potential. We hope our new report helps elevate what will surely be a heated debate. The Department of Energy snookered the media last week with a report that seems to show that its clean energy lending programs are profitable. “Remember Solyndra? Those loans are making money,” went a typical headline. Unfortunately, that’s not true. Taxpayers are losing money on DOE lending. Less than originally expected, and less than you would expect given media coverage of Solyndra, Fisker, and a few other failed loans. But smaller losses are still losses, not profits. To understand DOE’s spin, consider a simple example. Suppose your spouse borrows $10,000 from a bank at 5 percent interest over 10 years so that you can lend it to your friend Bob on the same terms. Everything goes well in the first year. Bob pays you, and your spouse pays the bank. If your aunt asks how the deal is going, what would you say? A good answer would be, “We are breaking even; let’s hope Bob keeps paying us back.” You and your spouse are in this together, the loans from the bank and to Bob offset one another, and your best hope is for that to continue. If DOE were asked, however, it apparently would say, “Things are great; Bob paid me $500 in interest, and I am on track to earn $5,000.” DOE takes credit for the interest that companies pay on their loans, but it doesn’t subtract—or even report—the interest costs that taxpayers pay to finance those loans. That’s like claiming profits on your loan to Bob, while ignoring the interest your spouse pays the bank. DOE’s report does not address this issue, except in a footnote in a table (cut and pasted above) revealing that its $810 million of “interest earned” was “calculated without respect to Treasury’s borrowing cost.” In other words, DOE reports gross interest received, not the net interest taxpayers have earned after subtracting Treasury borrowing costs. The incomplete figures in the table seem to suggest that DOE has eked out a $30 million profit on its lending ($810 million in interest less $780 million in loan losses). But when we account for Treasury borrowing costs, taxpayers are actually well behind. The report does not allow us to say just how far behind. We do know, however, that DOE loans are typically made at small, sometimes zero, spreads above Treasury rates. So a large portion of DOE’s “interest earned” must have been offset by borrowing costs. That puts taxpayer losses in the hundreds of millions of dollars. The same concern applies to DOE’s statement that interest payments on these loans will eventually top $5 billion. Some media outlets are reporting that as $5 billion of profit. It’s not. That $5 billion does not include the cost of Treasury financing or of any defaults. DOE’s $5 billion figure is like claiming your loan to Bob is scheduled to bring in $5,000 in interest; it’s technically true, but tells you nothing about profits. Indeed, the Obama administration still predicts that DOE’s loans will lose money over their lifetimes. 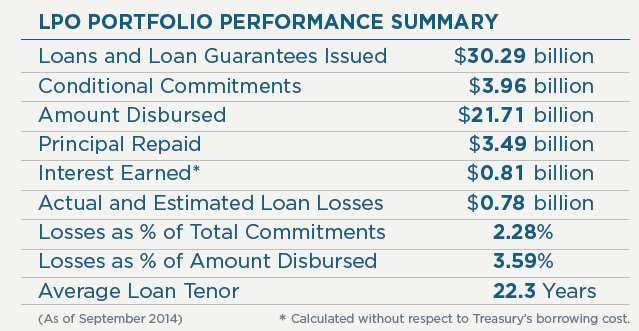 DOE’s lending programs should not be evaluated solely or even primarily based on their profitability or lack thereof. What matters is their overall social impact. How much are they advancing new technologies? How much are they reducing future pollution? Have they created jobs and economic growth? And are any gains worth the taxpayer subsidies? Those are the questions we should be trying to answer. If DOE wants to play the profitability card, however, it should do so in an accurate and transparent way. Last week’s report falls woefully short. DOE owes taxpayers an honest accounting of the financial performance of its lending programs. P.S. In recent work, I raised concerns about how the government budgets for lending programs. One issue is whether we should measure profitability against Treasury borrowing rates (as currently done) or against market rates (which the government could earn by unsubsidized lending). I expected that issue to arise in DOE’s accounting. Instead, the agency ignored the cost of capital entirely. Budget policymakers eliminated that ploy more than two decades ago, so it is stunning DOE would resurrect it. The existing environmental regulatory architecture, largely erected in the 1970s, is outdated and ill-suited to address contemporary environmental concerns. Any debate on the future of environmental protection, if it is to be meaningful, must span the political spectrum. Yet there is little engagement in the substance of environmental policy from the political right. Conservatives have largely failed to consider how the nation’s environmental goals may be best achieved. Perhaps as a consequence, the general premises underlying existing environmental laws have gone unchallenged and few meaningful reforms have proposed, let alone adopted. This essay, prepared for the Duke Law School conference on “Conservative Visions of Our Environmental Future,” represents a small effort to fill this void. Specifically, this essay briefly outlines a conservative alternative to the conventional environmental paradigm. After surveying contemporary conservative approaches to environmental policies, it briefly sketches some problems with the conventional environmental paradigm, particularly its emphasis on prescriptive regulation and the centralization of regulatory authority in the hands of the federal government. The essay then concludes with a summary of several environmental principles that could provide the basis for a conservative alternative to conventional environmental policies. The benefits of property rights at promoting both economic efficiency and environmental stewardship can be seen in the context of fisheries. For decades, fishery economists have argued that the creation of property rights in ocean fisheries, such as through the recognition of “catch-shares,” would eliminate the tragedy of the commons and avoid the pathologies of traditional fishery regulation. The imposition of limits on entry, gear, total catches, or fishing seasons has not proven particularly effective. Property-based management systems, on the other hand, have been shown to increase the efficiency and sustainability of the fisheries by aligning the interests of fishers with the underlying resource. A recent study in Science, for example, looked at over 11,000 fisheries over a fifty-year period and found clear evidence that the adoption of property-based management regimes prevents fishery collapse. Other research has confirmed both the economic and ecological benefits of property-based fishery management. The recognition of property rights in marine resources can also make it easier to adopt additional conservation measures. For instance, the adoption of catch-shares can reduce the incremental burden from the imposition of by-catch limits or the creation of marine reserves. A shift to catch-shares would have fiscal benefits as well. Yet in recent years, the greatest opposition to the adoption of such property-based management regimes has not come from progressive environmentalist groups, but from Republicans in Congress. He also endorses a carbon tax, which combines responsibility (the polluter pays principle) with a move toward consumption taxation. Here’s a good laugh line if you find yourself in a policy meeting about how to reduce gasoline use: suggest increasing the gasoline tax. During my time in the White House, I attended several meetings on this topic, and inevitably someone (sometimes me) would offer that simple idea. Everyone would then chuckle at its political insanity, and the conversation would turn to Washington’s policy of choice, increasing fuel efficiency standards for autos and cars. Politicians of both parties understandably fear that raising the gas tax would enrage voters. It certainly wouldn’t make lives easier for struggling families. But the gasoline tax is a tool of energy and transportation policy, not social policy, like the minimum wage. Instead of penalizing gasoline use, however, the Obama administration chose a familiar and politically easier path: raising fuel-efficiency standards for cars and light trucks. The White House said last year that the gas savings would be comparable to lowering the price of gasoline by $1 a gallon by 2025. But it will have no effect on the 230 million passenger vehicles now on the road. Greater efficiency packs less of a psychological punch because consumers pay more only when they buy a new car. In contrast, motorists are reminded regularly of the price at the pump. But the new fuel-efficiency standards are far less efficient than raising gasoline prices.